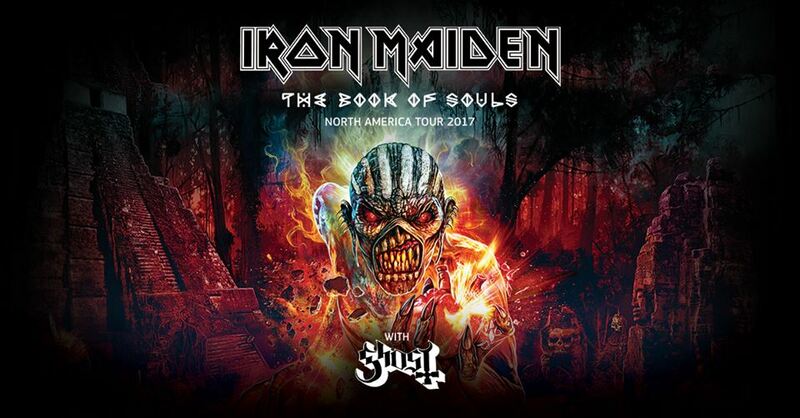 Following a 2016 run of fourteen sold-out concerts on the continent, Iron Maiden are returning to North America this summer for more dates on "The Book Of Souls" world tour in support their 2015 album of the same name. The 7-week trek – with Swedish rockers Ghost – opens in Bristow, VA on June 3, with shows wrapping up at New York City’s Barclays Arena on July 21. “We are really looking forward to returning to North America for a full tour,” says bassist Steve Harris. “We had always planned to go back there and to the U.K. as last year, due to the global nature of the tour and the period it took, we just didn't have time to cover them properly and we do still like to get to fans in as many places as possible! "We will, of course, be bringing the full production with us, including all the Eddies and the Maya-themed stage sets,” adds Harris. “There's been a great reaction from everyone to this tour's theme, people really seem to love it. We're still deciding on the final setlist and we'll work that out once we get into rehearsals. 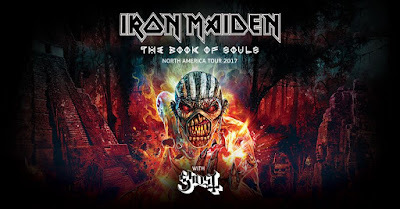 "Most of our North American fans haven't seen the show yet so as we want to give them the same 'Book Of Souls' live experience that we took around the world, it's unlikely we'll change much. And of course we know our fans appreciate us playing a lot of the older songs too, so we will continue to do that!" A full list of North American tour dates can be found below the video.